As you may have seen on my Instagram, I just recently went to Pixar Animation Studios in Emeryville, CA for the first time to attend an early press day for Toy Story 4. Why I can’t reveal what I learned about the movie yet (stay tuned for more posts next month), I did want to share something I really thought a lot about on the trip. The filmmakers mentioned how this film is very dear to everyone who’s been a part of it since it’s a franchise that has spanned 24 years. The actors and filmmakers think about where they were in their lives during each Toy Story movie release. When they said that, it really made me reflect about where I was in my life during each Toy Story movie. I realized that being 29 years old, this is a series of movies that has spanned almost my entire life, and each movie is important to me for different reasons based on my age and my life at the time I came out. Something I wanted to do, and encourage others to do for fun on social media, is to do a #MyToyStoryStory challenge. Where on Instagram, Twitter, or Facebook share where we were in life during each Toy Story release, and why each movie was important to us. I thought it would be wonderful way to self reflect on what these movies have meant to us fans as we gear up for the fourth chapter! When the first Toy Story came out, I was just five years old. Already at that age, I loved Disney movies and watched them all the time. With this being the first full-length computer animated movie, when I saw it looked different I was a little confused. I didn’t quite understand what computer animation was, but I just remember thinking how real the movie looked! When I saw the movie for the first time on VHS, I instantly fell in love. I watched it over and over and over again, so much so that I used a cassette recorder to record as much of the audio of the film as one cassette tape could hold, so that on long drives I could listen to the movie (although it only held up to the part where they drop the chain of monkeys from the window). I also tried to memorize the whole movie so I could reenact it in my head when I felt stressed or lonely in school. Fast forward four years later, when I was nine years old. Four years doesn’t seem as much of a leap given the giant gap between the most recent two Toy Storys, but it feels like a long time when you compare age 5 to age 9 – it felt like an eternity! I remember seeing this movie in the theatres opening day, which at that time seeing movies in the theatre was a rare occasion for my family. .I went with my grandma and uncle. My uncle, not necessarily a Disney fan, wanted to go see it because he was so curious what this film was that had created so much buzz (pun intended). The reaction and box office numbers he read in the paper from the first movie were so astounding he just had to see what it was all about. I remember on the drive to the movie theatre I was giving the backstory for Toy Story and important things to know when seeing the sequel. I was so excited for their to be a female lead character (Jessie), and I instantly loved her when introduced. After seeing the movie, I spent a couple weeks calling all my local McDonald’s to see when they were get the Jessie Happy Meal toy in so I could get it. I later on got a Jessie doll, and wore a red cowboy hat that was my uncle’s from the 60’s. When I had school the following fall in 2000, I asked my 5th grade teacher to call me Jessie, as that was my preferred nickname to Jessica. Since my teacher called me that, my fellow students called me that. Because of the timing, I had a few peers ask if it was because of Toy Story and I always denied it since i felt a little embarrassed about my level of Disney fandom (not the case anymore). Being called Jessie lasted for three years. I was completely shocked when Toy Story 3 was announced. I just assumed if we weren’t having a Toy Story 3 by now, it would never happen. Since I was near the age of Andy, I remember being very intrigued to see what his current story and relationship would be with his toys. This Toy Story was very special to me not only because Toy Story 2 at that time had remained my favorite Pixar movie so I was craving another sequel, but I was with my now-husband (then boyfriend). I felt so lucky that we were able to experience a newly released Toy Story together in the theatres, something I never thought would happen! I may have been surprised with Toy Story 3 that I was getting to see a new Toy Story with as an adult with my future husband, but imagine my surprise when I found out there would be a Toy Story 4 that I would be able to experience in the theatres with my daughter! My four-year-old also loves Toy Story as much as I did as a child, and has many of the Toy Story toys. They’r her favorite go-to toys, and she calls them “the crew.” She always puts a new member of “the crew” on her wishlist for when she gets a new one. I just added Forky to her collection (I made him at Pixar) and next on her wishlist is Ducky and Bunny. With the June release date approaching, it is really hitting me that I get to have this experience with her of seeing a new heartwarming Toy Story with her on the big screen. I can’t help but feel emotional, and self reflective as I realize my fandom for Toy Story is about to come full circle. 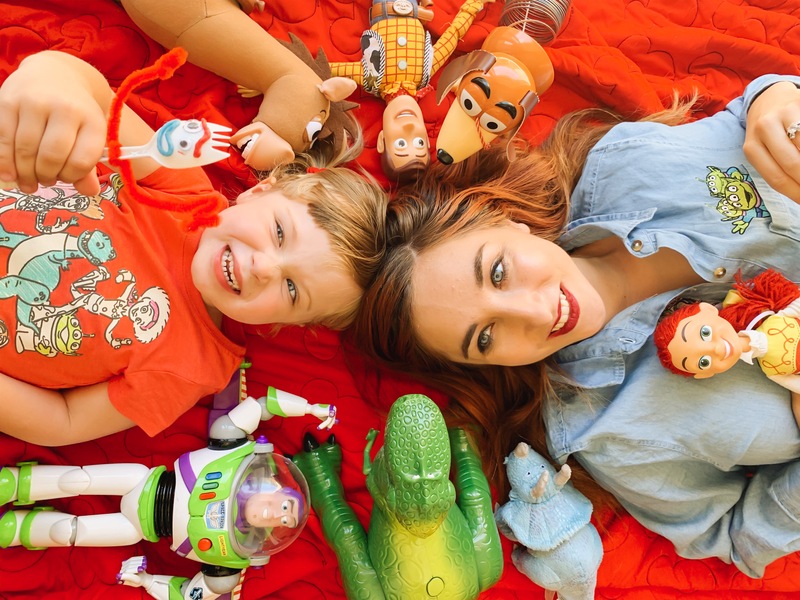 Share Your Toy Story Story! I challenge you to share your stories, by posting about where you were in life or why each Toy Story is meaningful to you using hashtag #MyToyStoryStory! Have fun, and feel free to tag me @thehealthymouse on Instagram or @healthy_mouse on Twitter so I can see your Toy Story Story challenge.